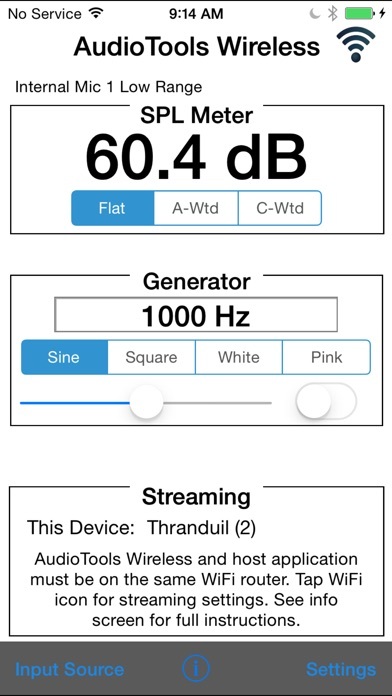 AudioTools Wireless is a pro-caliber SPL Meter, with A and C weighting, and also includes an audio signal generator that can produce sine waves, square waves, and white and pink noise. It also can send the microphone audio wirelessly to other Studio Six Digital apps running on another iOS device over a LAN. In addition to sending the uncompressed digital audio, AudioTools Wireless also sends the calibration data to the host application, so that the dB value on the host application will match the value on the AudioTools Wireless device. When linked to a Studio Six Digital audio app, AudioTools Wireless can also be used as a remote generator, so that you can control the generator output signal wirelessly. AudioTools Wireless is compatible with the Studio Six Digital iTestMic. Since iTestMic stores its calibration internally, when you plug it into AudioTools Wireless that calibration is extracted and transmitted to the host device. Data is sent in full 48kHz 16-bit format, uncompressed for full fidelity. You can control the latency to account for local network performance.